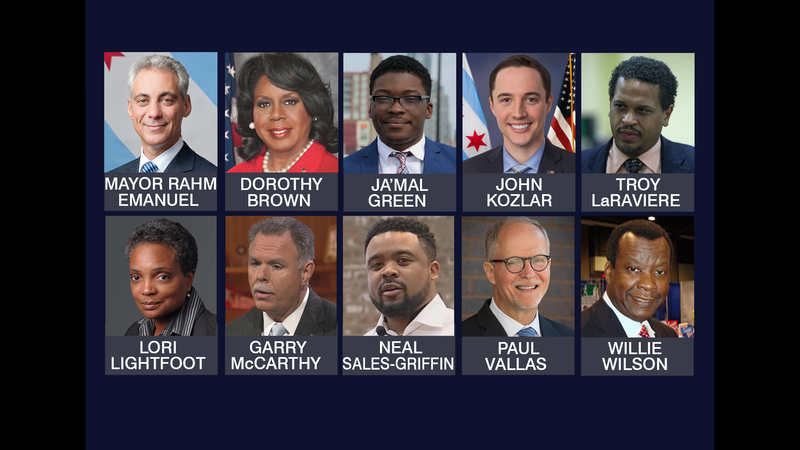 Chicagoans are going to need a scorecard to keep track of the 2019 race for mayor. So far, nearly a dozen candidates have either declared or stated their interest in running. Thursday, former Police Board Chair Lori Lightfoot will announce her candidacy. And there may be more to come. To put Mayor Rahm Emanuel’s fundraising advantage into perspective: a total of $6.6 million has been raised so far in this campaign, according to the Illinois Campaign for Political Reform, $6.1 of it by Emanuel. To say he has a decided fundraising advantage is an understatement. But that has not stopped the field from growing. Lightfoot is also the former head of Emaunel’s Police Accountability Task Force that put together recommendations for improving the conduct of officers in the wake of the 2014 fatal shooting of Laquan McDonald. Also in the race are embattled Cook County Circuit Court Clerk Dorothy Brown; activist Ja’Mal Green; John Kozlar, a former candidate for 11th Ward alderman; former Chicago Public Schools principal Troy LaRaviere; former police Superintendent Garry McCarthy; entrepreneur Neal Sales-Griffin; Paul Vallas, former CPS CEO and budget director for Mayor Richard M. Daley; and businessman Willie Wilson. Beyond Emanuel’s major campaign haul, McCarthy has brought in $212,000; Wilson $119,408, much of that his own money. Meanwhile, Vallas has yet to bring in anything. This, according to records kept by the Illinois Campaign for Political reform, which says that Emanuel’s money comes from the big movers and shakers who are signing big-time checks. The major infusion of campaign cash may signal that Emanuel is taking no chances with the field of candidates he faces. But his campaign seems to think that the glut of names will only give Emanuel a leg up. “We have an expanding field of candidates, and you already see they understand the only way to get into a runoff with the mayor is to attack each other. The race will be like 10 cars trying to get into one lane and it won’t be pretty. So we say the more, the merrier,” said Emanuel campaign Spokesperson Pete Giangreco. Both Lightfoot and McCarthy were initially hired by Emanuel. Both defended and lauded the city’s response to the McDonald shooting, Lightfoot saying that the mechanisms in place for the city actually worked well. They’ll have to explain their way out of that. Lightfoot is attempting to run as more of a progressive candidate; McCarthy will be most popular among conservatives in the city. Vallas, as a result of his history, slots in to the right of the mayor. Brown and Wilson have name recognition in the African-American community. Lightfoot and some of the other candidates will have an uphill battle on that front, although all face an uphill battle when it comes to fundraising. And the field could yet expand more. Cook County Commissioner Bridget Gainer is expected to make a decision on entering the race in the next month, with all signs pointing to a run. She does have some fundraising ability. Activist and former Democratic candidate for lieutenant governor Ra Joy is also weighing a run.